Flat files create a sharp work center. The Flat File is a classic with stylish design accompanied with quality construction and quiet access. Your Flat File is an office gem with chic lines and chrome hardware. Files are modular, so they can be used individually or in a space-saving stack. 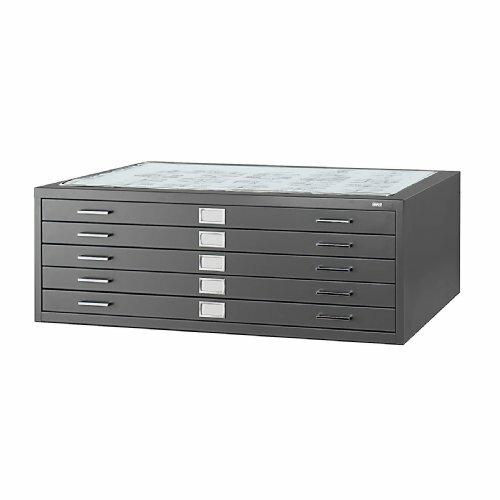 5 drawer Flat File steel cabinet with powder coat finish for up to 26" x 37" documents, sheet capacity 500 active; 750 semi-active; 1000 inactive. Drawer dimensions 43"W x 32"D x 2 1/8"H (ID), label holder on drawer fronts dimensions 3 1/4"W x 1 7/8"H (OD). Case-hardened ball-bearing nylon rollers provide you with smooth, quiet operation. Positive closures keep your drawers tightly shut, while courtesy stops keep them in place while open. Keep contents clean with a rear hood and hinged front depressor. Stack up to 5 units on Safco Products Closed Low Base Model 4997BLR (sold separately), stack up to 2 units on Safco Products Open High Base Model 4977BL (sold separately). optional Lock Kit includes lock and two keys Model 4981 (sold separately).